ISLAMABAD: Pakistan Air Force chief Marshal Sohail Aman on Saturday held meetings with the government and military officials of Azerbaijan during his official visit to the country. At the start of the visit, the air chief laid a floral wreath at the grave of the national leader of Azerbaijan Heydar Aliyev and his wife Zarifa Aliveva. Later on, he met with First Deputy Prime Minister Yaqub Eyyubov, and Republic of Azerbaijan’s Emergency Situations Minister Kamaladdin Heydarov. During the meetings, the air chief underlined the importance of expanding mutual cooperation and resolved to take it to further heights. He talked about Pakistan’s support to Azerbaijan on the issue of Nagorno-Karabakh and reiterated that Pakistan would stand with Azerbaijan. He also thanked the Azerbaijan government for their support to Pakistan on the burning issue of Kashmir. 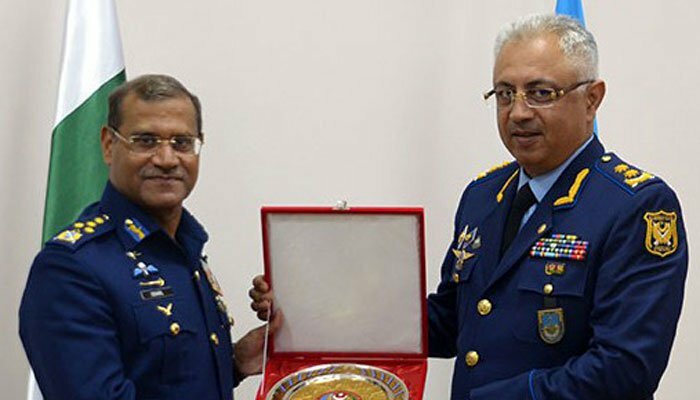 The air chief also called on Azerbaijan’s Air Force Commander Lieutenant General Ramiz Tahirov. Both the dignitaries discussed matters of professional and mutual interest. The air chief pledged to meet the timelines of the contract for the provision of Super Mushshak aircraft to Azerbaijan. Moreover, he also discussed the prospects of training Azerbaijan Air Force personnel at PAF institutions. Later in the day, the air chief visited Military Academy of Armed Forces of Azerbaijan to deliver a lecture on “Application of Airpower in Asymmetric Warfare”. Addressing the audience, the air chief highlighted PAF’s pivotal role in the fight against terrorism and said that PAF, in synergy with armed forces, has successfully rooted out the menace of terrorism from the country. He further said that although Pakistan has suffered the most in the war against terrorism, yet it has not diminished its resolve to fight for ensuring peace in the region.